Prunella vulgaris: Friend Or Foe? Prunella vulgaris was once a very familiar and well-known plant. The Algonquin of Quebec used it as a fever reducer. 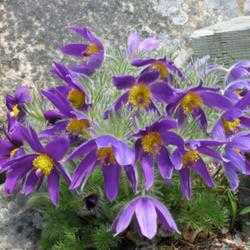 It has been used extensively in herbal medicine around the world and as a pot herb. This pretty purple plant is both loved and despised by gardeners. It all depends on where you find it. Prunella vulgaris is a native herbaceus plant in the genus Prunella. It's also known as selfheal, heal-all, woundwort, heart-of-the-earth, carpenter's herb, brownwort and blue curls. 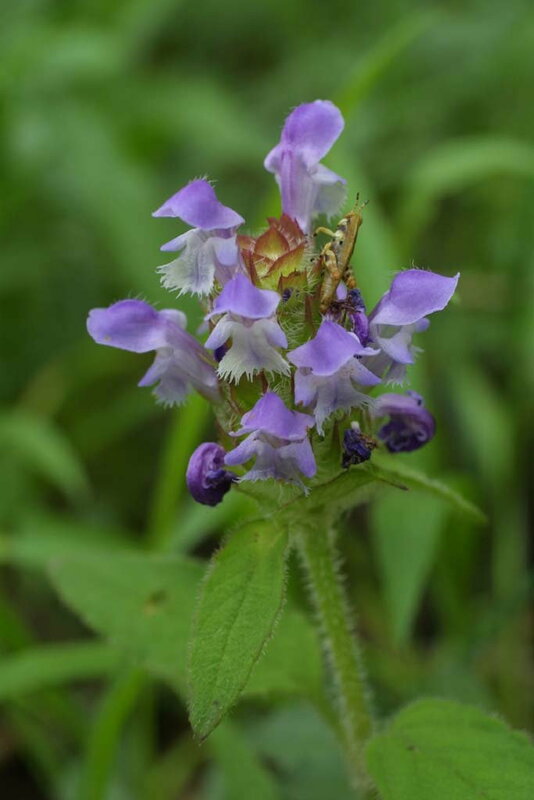 Prunella vulgaris grows 2-12 inches tall, with creeping, self-rooting, tough, square stems branching at leaf axis. Leaves are lance-shaped, serrated, reddish at the tip, about an inch long and a half-inch wide. These grow in opposite pairs down a square stem. Each leaf has 3-7 veins extending from the middle vein to the leaf margin. The stalks of the leaves are generally short but can be up to 2 inches long. Flowers grow from a squarish, whirled cluster. Immediately below the bloom is a pair of stalkless leaves. Flowers have two lips and are tubular. The top lip is a purple hood; the bottom lip is often white, three-lobed, with the middle lobe being larger and fringed upwardly. 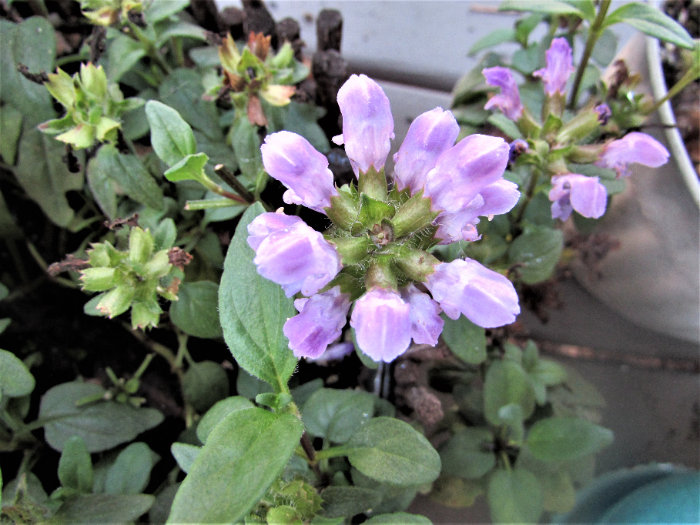 Flowers bloom at different times depending on climate and conditions, but mainly from June to August in the U.S.
Self-heal propagates both by seed and vegetatively by creeping stems that root at the nodes. This member of the mint family looks much like a mint but lacks any fragrance. It can be found in much of North America and is hardy in zones 4 through 9 at least. Heal-all is edible and can be used in salads, soups, stews, and boiled as a pot herb. The Cherokee cooked and ate the young leaves. The Nlaka'pamux, an indigenous First Nations people from the North Cascades region of Washington State, drank a cold infusion of the whole plant. The plant contains vitamins A, C, and K, as well as flavonoids and rutin. The young leaves and stems can be eaten raw and the aerial parts of the plant can be powdered and brewed into an infusion to make a beverage. The opinion of herb gardeners about P. vulgaris is divided. 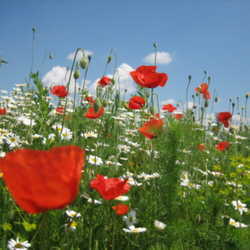 Some welcome its flowers in the summer lawn while others denounce the plant as a pesky weed. Few grow it intentionally in their gardens and some don't know the plant at all. This situation differs markedly from several centuries ago when herbalists held the plant in high ­es­teem and used it frequently. Self-heal’s square stems arise from a fibrous root system that sprawls 2 ft. or more along the ground before turning upward. This habit makes the flower heads appear to be borne on stems only around a foot tall. The leaves are medium green, opposite, rounded at the base and pointed or blunt at the tip. The edges are slightly wavy or toothed. The stem and leaves are slightly hirsute. The flower head is a stubby spike made up of ­numerous whorls of six florets each. Each whorl has a pair of green-veined whitish bracts beneath it. Each floret has a brownish-purple toothed calyx that contains a violet two-part corolla. The upper part, which is often more intense in color, forms a little hood, and the lower is a three-part apron that makes a convenient landing platform for insect pollinators. As the flower head matures, the spike elongates but remains more or less widely cylindrical. 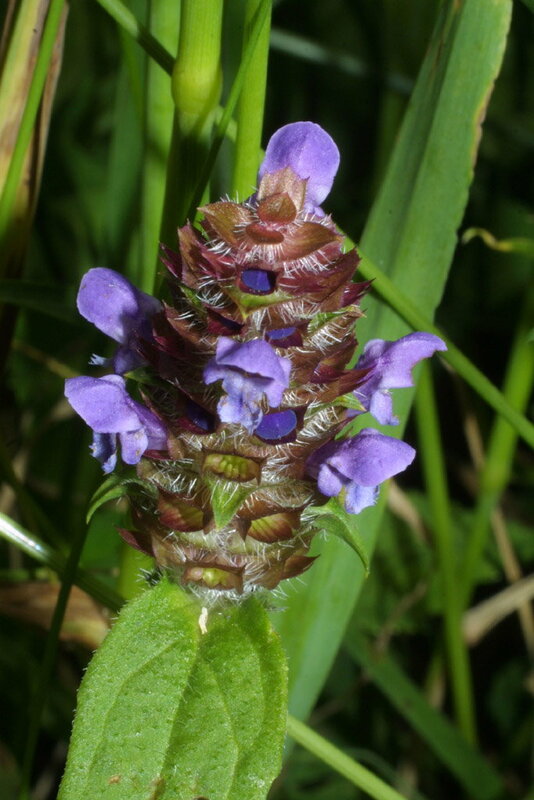 Although self-heal is edible, it has few traditional culinary uses. You can soak chopped fresh leaves or powdered dried leaves in cold water to make a beverage. However, many people find it unpleasant tasting. The raw leaves have little flavor at first; chewing brings out a slight bitterness. Prunella vulgaris is sometimes used in medicine to treat wounds, insect bites, and oral herpes. Recent research suggests it may also have anti-mutagenic properties, indicating a possible treatment for certain cancers. 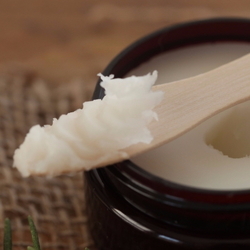 Other studies have shown it to possess a wide variety of pharmacological effects, including antioxidant, anti-inflammatory, astringent, and antimicrobial. 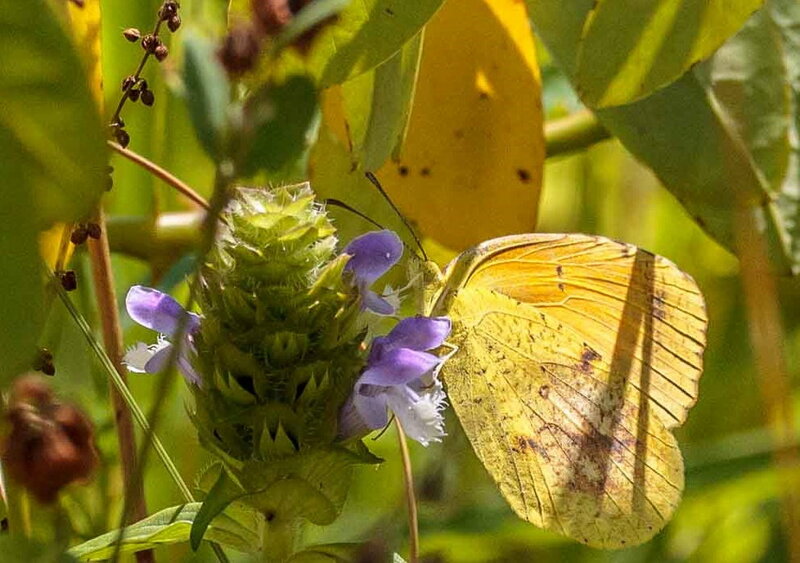 Self-heal is a favorite of bumblebees, butterflies and other pollinators and is the larval host for the clouded sulphur butterfly. This herb will never fail. That they are well again.